Almost one billion people, an eighth of the world’s population, are hungry as you read this. Why? The number of people experiencing hunger has risen by about 100 million in the past 5 years to more than 900 million. Children tend to suffer the most, with malnutrition contributing to the deaths of more than 3.5 million children under five every year. One hundred million to 140 million children are deficient in vitamin A. Two billion people, mainly women, are iron deficient. In developing countries, households often spend up to 70% of their income on food purchases. The average price of food has risen sharply over the past decade, as this graph shows. Global food prices in actual dollars (nominal) and after accounting for inflation (real). Graph from UN Food & Agriculture. This has made it more difficult for poorer nations to purchase food, with the result that 21 African countries and 10 in Asia require external assistance. The most obvious thing we can do is to donate money to a responsible aid organisation. This doesn’t provide a long term solution, but is necessary for crisis situations. In an End of financial year appeal, TEAR Fund suggests donating a day’s pay. World Vision does a lot of good work in famine relief. Ethicist Peter Singer recommends Oxfam. He has suggested we should all give away 25% of our pay to reduce inequality, but now offers a sliding scale of giving for our consideration. (Those earning over $A150,000 should give 5%, the rest of us should give at least 1%, increasing as our income approaches $150k. Reduce our energy usage to be part of measures to reduce global warming, which is already having a serious impact on countries on north Africa, which will suffer significant water shortages in the future. Reduce use of ethanol based petrol, to make grains available for food. Should our need to drive a car cheaply be part of the reason why children starve? Eat less meat, especially grain fed beef, to free up more grain for food. Eat and waste less food, to reduce demand on already stretched food supplies. Vote for politicians who will give priority to responsible aid and development programs. However these steps are not likely to be a major source of positive change on their own. World action at a national level is also needed, and we can advocate for this by pressing our politicians. Advocate on behalf of action on global warming, one of the key threats to future food supplies. Encourage governments in the richer countries to invest aid in programs to lift agriculture yields, another key necessity for many poorer countries. 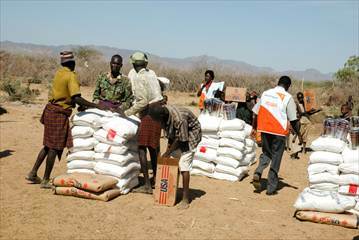 World Vision on the Global Food Crisis and Global Hunger. Professor Chris Barrett, of Cornell University, on Global Food Shortages in the Sydney Morning Herald.